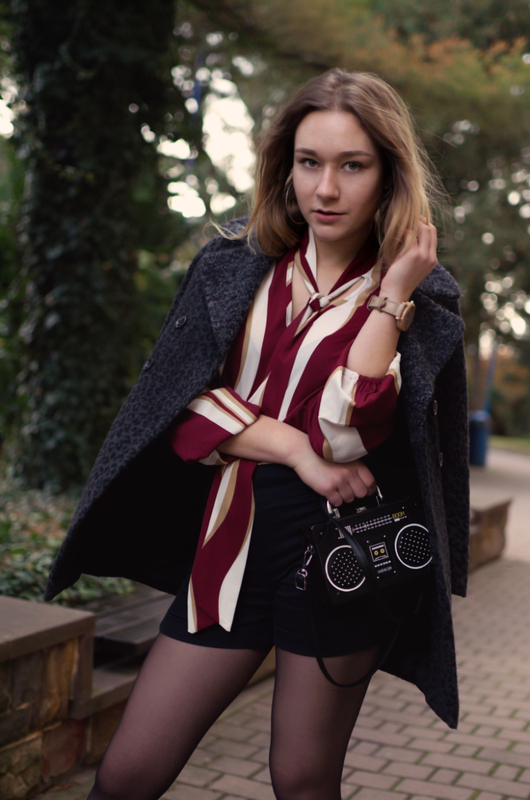 This entry was posted in Styling Sheer Tights and tagged black boots, black skirt, black tights, Blogger, boom box, Pantyhose, Sara's City, sheer black tights, sheer tights, Tights on November 1, 2018 by tightsreview. 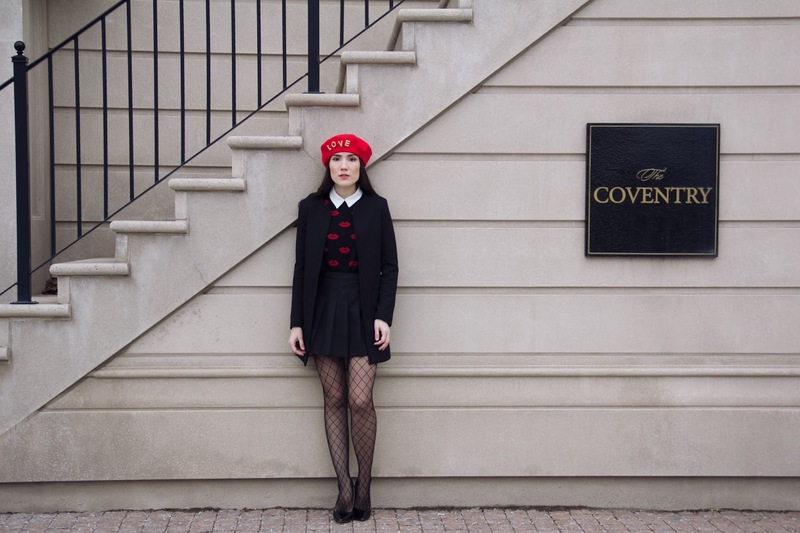 This entry was posted in Styling Sheer Tights and tagged black heels, black skirt, Nameless Fashionblog, red sweater, sheer tights on October 30, 2018 by tightsreview. This entry was posted in Styling Sheer Tights and tagged black boots, black leather skirt, black skirt, black tights, Blogger, Pantyhose, sheer black tights, sheer tights, The World Needs Blondes, Tights on September 21, 2018 by tightsreview. Can you imagine that we’ve already arrived at the middle of the week? I know most of you work at the office and indeed, sometimes it gets lonely having to stay at home and not having a closet packed with office clothes, but I still wanted to show off a really cute office look that I personally would wear to work ! Since my Manfield shoes have a 70s vibe to them, I thought I should add a more feminine touch in the upper part of my outfit, just to sweeten the deal. Now these shoes can be worn in many ways and you can definitely play on the masculine style and wear them with a pair of pants, in a suit..you know, go full rogue in that direction. But here, I wanted to build a softer look. The shiny leather is quite an unique touch to the shoes and the thick heel makes them a comfortable pair of shoes that you can actually walk in and stay all day at the office. Add a pencil skirt, a pair of tights and an envelope clutch and you’re good to go for this Fall ! This entry was posted in Styling Sheer Tights and tagged black skirt, black tights, From Brussels with Love, Gatta, Gatta Tights, office, office attire, pencil skirt on March 26, 2018 by tightsreview. Is It Still Cold Where You Are? No ratings yet. This entry was posted in Styling Fishnet Tights and tagged black booties, black skirt, fishnet tights, puffy jacket, TC Style Clues on March 20, 2018 by tightsreview. This entry was posted in Styling Sheer Tights and tagged Andy Sparkles, andysparkles, black heels, black skirt, black tights, elegant, sheer black tights, sheer tights on March 2, 2018 by tightsreview. Despite currently living in jumpers and jeans, for the sake of avoiding being too repetitive with my outfits I decided to give the jeans a break (albeit not for long I imagine) and pop on my favourite skirt of the winter. I’m genuinely surprised by how much I’ve worn this vinyl skirt as I didn’t think the vinyl trend was for me. Believe it or not, I wasn’t actually sure about whether I’d get much, if any, wear out of it but it just works with everything I own! 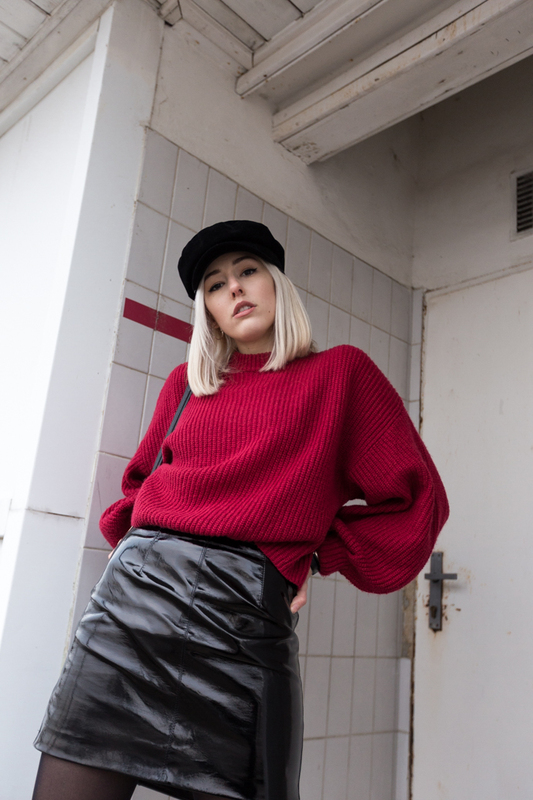 I’ve paired this skirt with both simple roll neck tops and thick knit jumpers like this one for a casual approach and love the way it comes together – there’s something about it that is so effortlessly stylish. By default I would associate a vinyl skirt with dressing up and going out but I haven’t even tried styling it for a night out and am rather enjoying dressing down this statement piece. Of course I need to talk a bit about this jumper, I’m loving the fact stripes are making a comeback and these bold colours are super fun! I’ve spotted so many amazing striped knits recently and I just want them all! I have my eye on those rainbow tops everybody seems to be wearing right now. This jumper is New Look and I’m completely obsessed with the colour combo, there’s something really retro about it that I love. Available in four different colourways: pink (the one I’m wearing), red and blue, I tried two out of the three and decided on keeping the pink because I really loved the combination of colours. One thing I love about experimenting with my style is the discoveries I make whilst doing so. This skirt and jumper combo is one I would probably steer clear of but I really love the combination of colours and textures. 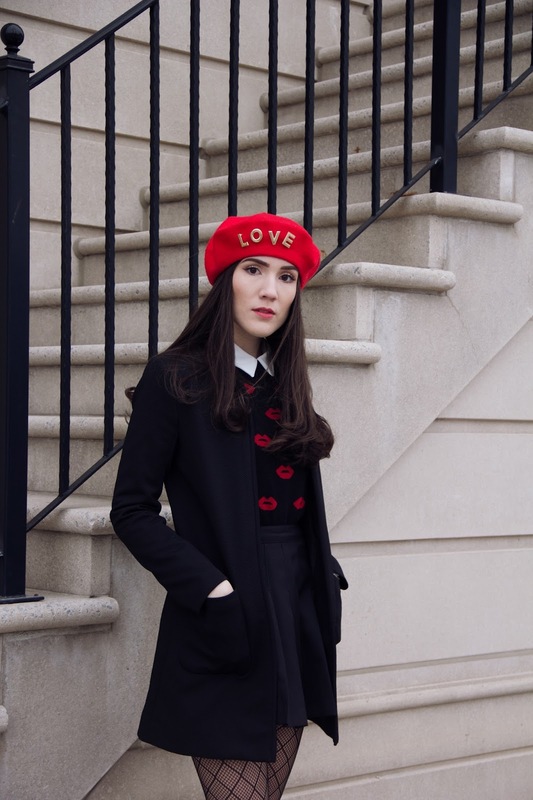 This outfit somehow manages to be stylish (at least in my opinion) and perfect for winter! This entry was posted in Review: Sheer Tights and tagged black skirt, black tights, booties, knit sweater, Peexo, stripes on January 11, 2018 by tightsreview. More Polka Dots	No ratings yet. This entry was posted in Styling Patterned Tights and tagged besugarandspice, black heels, black skirt, black tights, polka dots, While sweater on May 26, 2017 by tightsreview.